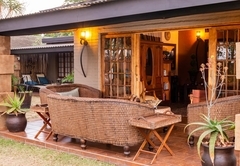 Ama Zulu Guesthouse & Safaris is a 4 star graded guest house offering Hluhluwe accommodation in 7 guest rooms. 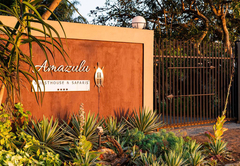 Ama Zulu Guesthouse & Safaris is situated in the heart of Hluhluwe on the beautiful untamed Elephant Coast in KwaZulu Natal, South Africa. 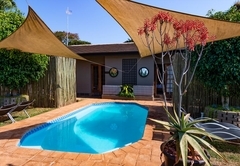 This guest house offers comfortable accommodation in Hluhluwe in a relaxing atmosphere at affordable rates. 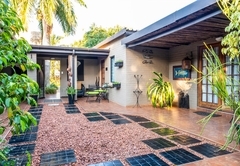 The tastefully furnished and decorated three bedrooms all have private entrances, en-suite bathrooms and are equipped with coffee / tea making facilities, bar fridge and colour TV (M-Net). 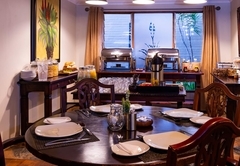 A full English Breakfast is served in the dining room. Dinner is available by prior arrangement. 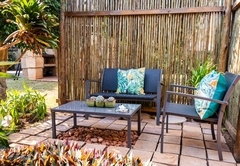 “Braai” packs are also available. 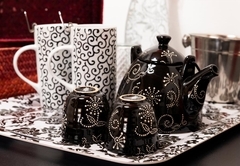 All special meal requests can be discussed with your hostess. 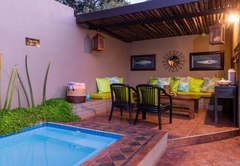 Guests are welcome to relax in the courtyard or the pool and jacuzzi area and enjoy the fresh air and sunny skies. 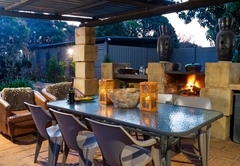 Braai / barbecue facilities are available. Laundry service available. Children welcome. 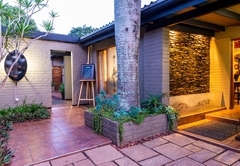 This Guesthouse's greatest asset is its ideal situation between the world-renowned Hluhluwe / Umfolozi Game Reserve and the Greater St Lucia Wetland Park where the untamed wildlife and marine reserves meet, creating an eco-system of unparalleled bio-diversity. 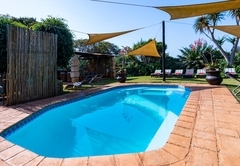 Ama Zulu Guesthouse is also within easy reach of Sodwana Bay, St Lucia, Cape Vidal, Lake Sibaya, Mkuze Game Reserve as well as Ndumo Game Reserve, Tembe Elephant Park and Lake Josini. 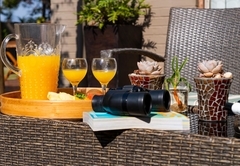 Champagne breakfasts, bush braais, lunch packs as well as picnics in the park can also be arranged on request. 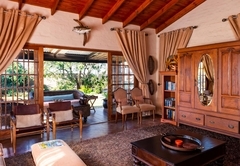 Qualified field guides will take you on safari in comfortable, modern open game-drive vehicles. Daily Game Drives in open 4x4's to the Hluhluwe / Umfolozi Game Reserve on offer if you are interested, with the possibility to view the Big 5 as well as a large variety of other animals. 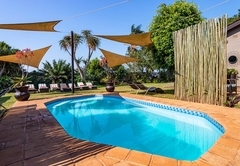 Daily boat trips on the St. Lucia Lake to view Hippo, Crocodile and numerous waterbirds, combined with a coastal game viewing trip and a swim in the Warm Indian Ocean will fill a wonderful day in the Wetlands Park near the coast. 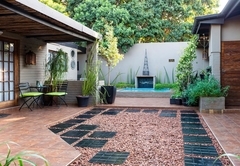 Luxury Spacious Bedroom overlooking garden with large en-suite bathroom, double hand basins, shower, bath & toilet. 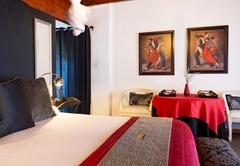 King-size double bed (convert x2 singles), air-con, bar fridge, microwave, DSTV and coffee and tea tray. Fully equipped. Spacious Bedroom overlooking garden with en-suite bathroom, shower only, toilet and double hand-basins. 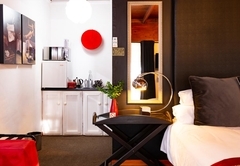 Queen-size double bed, air-con, bar-fridge, microwave, DSTV and coffee and tea tray. Fully equipped. 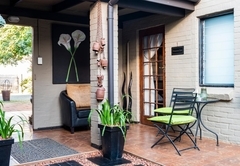 Spacious Bedroom overlooking the garden with en-suite bathroom, shower, bath, hand-basin and toilet. 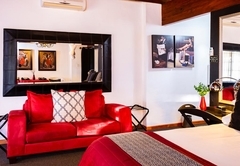 Queen-size double bed, air-con, bar-fridge, microwave, DSTV and coffee and tea tray. Fully equipped. 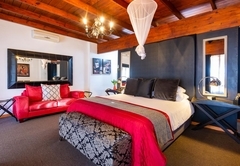 Luxury Spacious Bedroom overlooking pool with en-suite bathroom, bath, shower, hand basin and toilet. 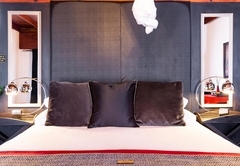 Queen-size double bed, air-con, bar-fridge, microwave, DSTV and coffee and tea tray. Fully equipped. 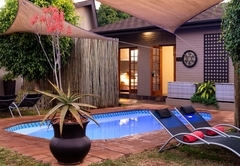 Spacious and elegant room overlooking the main pool area with your own private patio area. 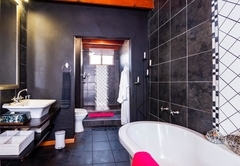 This room have a en-suite bathroom with shower and bath. 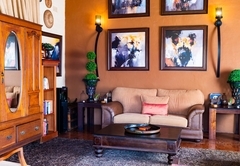 Tea and coffee facilities, microwave, bar fridge, air-conditioning, flat screen tv, dstv. 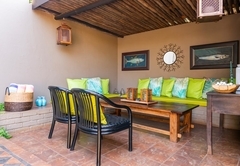 Self catering unit with 3 bedrooms and one shared bathroom. 2 flat screen TV's with full DSTV for families. 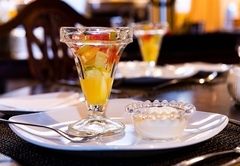 We have a kitchenette fully equipped with stove, microwave, fridge and tea and coffee facilities. Lounge area. 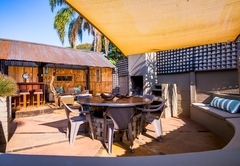 Large entertainment area with fire place. Outstanding lodge. 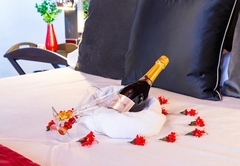 Rooms & service of highest standard. Thanks for a wonderful stay. 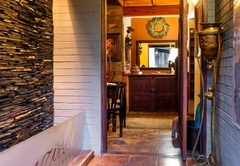 Comfortable accommodation, conveniently located close to Game reserve gates. Great personal service and information from hosts. Hearty breakfast. 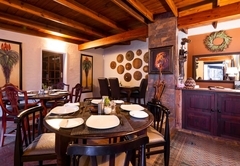 Dining in the village limited to fast food or local hotel, so use the excellent braai facilities provided. 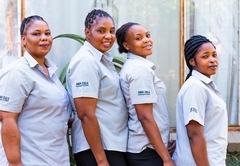 Response timeAma Zulu Guesthouse & Safaris typically responds to requests in 5-10 minutes.